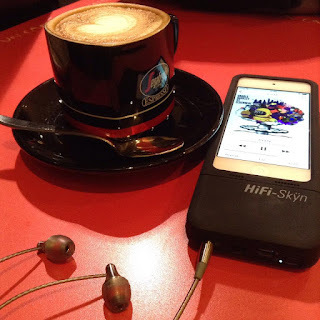 I first met the Echobox team in Tokyo at the Fujiya Avic headphone show in early 2015 where I was introduced to their upcoming and unique looking DAP The Explorer. later after I started Head Pie I got in contact with Echobox and interviewed them for our blog. John Darko spotted in the wild with the Echobox team at the e-earphone festival. 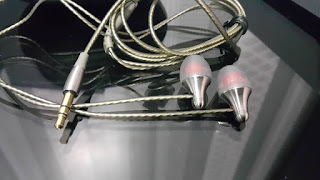 Later on we again met in person again at the e-earphone portable festival in Japan, Echobox graciously gave Head Pie two sets of the Finder X1 to review and give feedback on. The Echobox Finder X1 comes in an exquisite packaging, fine lines and beautiful design make this a joy to open. Users have commented on the filters - either they are hard to get out and one has to damage the box to do so, or else they fall out all too easily. Echobox are aware of this issue and are working on rectifying it. See and read more at the above two links. The build of the Echobox Finder X1 is top notch. Made from titanium it is lightweight and robust. They are near perfectly machined and stunning to look at. I found the size of the earphones to be suitably small and compact. The see through cable is gorgeous to look at and reminds me of many quality custom cables. The cable itself is strong, supple and flexible. 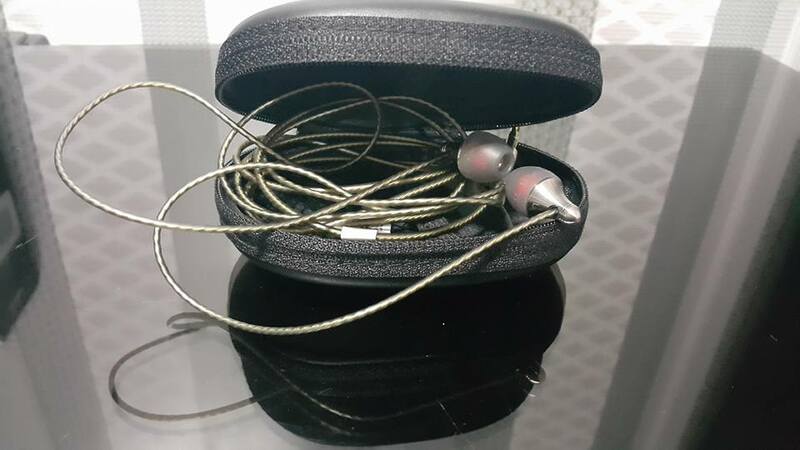 At the point where the cable enters the earphone there are contrasted rubber rings to denote which ear to place these beauties within, red for right for one example. So in a way it was almost as If I was reviewing three sets of earphones, or four. Also tip rolling to find that perfect fit and complementing sound took some time and then I was back to square one with the filter testing. There have been some great reviews on the Echobox Finder X1 already, so I am just adding to the pot as it already stands. Most reviews seem to agree on the main strong and weak points of the X1. Head-fi has a couple of good reviews and Nathan of Ohm Image and Headfonia has done an excellent job as usual. Basic measurements supplied by Echobox. Many reviewers have noted the Finder X1 as a V shaped earphone, I myself place it more in the small u shape category. Of course it differs ever so slightly depending on filter, fit and tip as shown by inearspaces measurements. The highs can certain seem too extended and overly bright at times, this was more subdued to an acceptable level when I started using the JVC Spiral Dot tips and as time went on. The mids come and go it seems, which gives rise to the popular idea of these being of a V shape sound signature. The Finders reproduce fairly accurately most music tracks, detail is at an acceptable and lifelike level, though not to the $500 plus side of things of course. I have read various early impressions which described it as a metallic sound - I myself heard that tinny treble which seemed to go away after I got a few hours on them. The first few days I did find myself wanting to break out my DITA-The Truths from my bag but as time went on and I ditched the black filter for the white (I wanted to start out with the reference-for reference) and as my tip rolling became more successful I started to enjoy the Finder X1 more and more, as an understated workhorse so to speak. The Finder X1 either burned in, or my ears and brain adjusted to accommodate them - choose the phrase which best fits your belief system. But definitely after I got a few hours on them, or into them they certainly become better and more pleasant to the ears. The highs tamed, the bass became more tight and less overpowering and also the mids came up a tad to even things out. The initial V slowly transformed to a U and then quickly moved to a u shape sound. A good sixty hours on average will transform these from an ugly duckling in an easy to listen swan. I find the Finder X1 to perform well whether straight out of a Dap or when using extra amplification. Most of my testing was done with an ipod touch 6G connected to a Centrance hifi-Skyn using Flacplayer app. 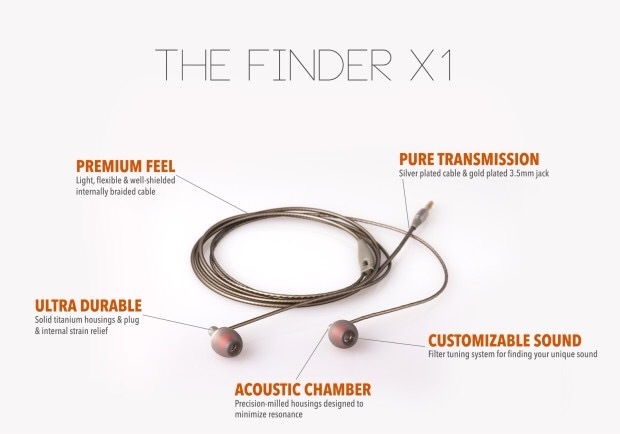 It, the finder X1 has enough instrument separation to please, bass and highs to thrill, a little more mids would be lovely though, detail is very good for its price range, sound stage is an acceptable width and breath considering its price point. The Echobox Finder X1 are on the small side when compared with todays Mac Truck multidriver IEMs. This makes them suitable for nearly any ear size, when connected to the lightness of the build this makes them appropriate for most users. Those with a larger size earhole may find it may penetrate too deep and the surrounding metal could rub against the outer part of the ear canal. I have found as usual tip rolling, or trying out different brands of tips is essential to acquiring a proper fit, seal and insertion. Some users have commented that the Finder X1 requires a deep insertion, or tends toward a deeper insertion naturally. Currently my favorite tip for the Finder X1 is the JVC Spiral Dot tips. I have tried Comply, Sony, Sony Hybrid, Ortofon and Spinfit tips. You definitely need a proper fit/seal for these to sound at their best or else the bass is thin and highs can end up shrill or tinny. I find wearing the X1 over the ears to be suitable and a secure fit for myself. 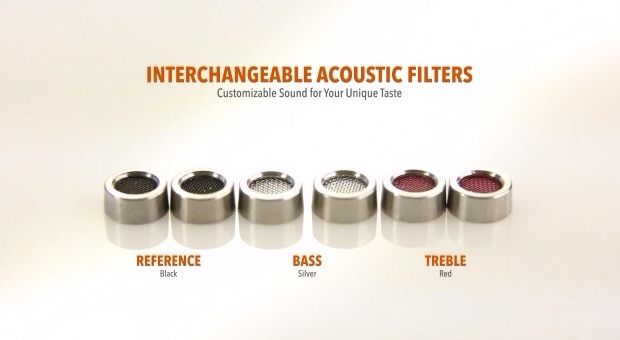 Three sets of filters to alter the sound to suit ones tastes. Easy to change by unscrewing one and then screwing in the newly chosen filter. Extra stock tips including double and triple flange tips. A durable and compact carry case. Echobox initially offered the Finder X1 at a low price of US $79 on an indiegogo campaign. The Echobox Finder X1 will eventually settle on a final retail price of US$199. The Echobox Finder X1 is a wonderfully done earphone, certainly a superb first attempt. Is it perfect? No. Does it fit within the final asking price range of US$200 in ears, I would say a strong: yes. If you were lucky to have bought it earlier on at either one of the discount prices you certainly got a bargain. The Finder X1 is a keeper for me. Finding the right filter is a key start, the Finder X1 seems to generally ship with the white filter, others prefer the black reference filter, few settle with the red. As mentioned early these do benefit with a bit a breaking in or burn in imho, or if you don`t believe in that sort of thing then it would be your ears getting more used to their sound. Also tip rolling and finding the right tip is essential, but this could be said for most IEMs and IEM users. People who have been through a few sets of in ears generally have a small store of tips to chose from. In summary the Finder X1 whilst not being an all rounder certainly ticks many of the boxes for the casual to serious listener. No doubt many improvements will be made from the feedback of the audio community which will be incorporated within the future Finder X2, whilst most complaints have been minimal and seem to have largely faded from the early demo releases, some niggles remain such as the at times tinny highs which some have pointed out fade with a bit of time and as I wrote proper fit/seal and tips. 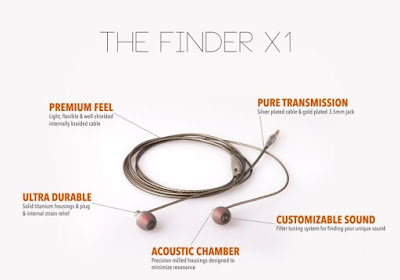 The Finder X1 I would honestly say is an IEM that performs well and even the most jaded buyer of audio products would find the build something to behold, the packaging a Christmas in itself and the sound non distracting - in the sense that one can just relax and enjoy the music and stop listening to the gear for change when all the pieces: filters, tips etc balance out to a point of pleasure. Thank you again to Echobox for providing the finder X1 for review. The key as you have stated are finding the right tips and above all a good seal. Once this are achieved sit back and enjoy.